Product prices and availability are accurate as of 2019-04-17 19:02:02 UTC and are subject to change. Any price and availability information displayed on http://www.amazon.co.uk/ at the time of purchase will apply to the purchase of this product. On the morning of 22 August 1485, in fields several miles from Bosworth, two armies faced each other, ready for battle. The might of Richard III's army was pitted against the inferior forces of the upstart pretender to the crown, Henry Tudor, a 28-year-old Welshman who had just arrived back on British soil after 14 years in exile. Yet this was to be a fight to the death - only one man could survive; only one could claim the throne. It would become one of the most legendary battles in English history: the only successful invasion since Hastings, it was the last time a king died on the battlefield. But BOSWORTH is much more than the account of the dramatic events of that fateful day in August. 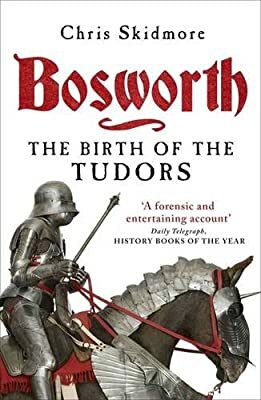 It is a tale of brutal feuds and deadly civil wars, and the remarkable rise of the Tudor family from obscure Welsh gentry to the throne of England - a story that began 60 years earlier with Owen Tudor's affair with Henry V's widow, Katherine of Valois. Drawing on eyewitness reports, newly discovered manuscripts and the latest archaeological evidence, Chris Skidmore vividly recreates this battle-scarred world in an epic saga of treachery and ruthlessness, death and deception and the birth of the Tudor dynasty. A fantastic and entertaining account of 1485, perfect for those with an interest in history. This paperback book has 437 pages and measures: 19.7 x 12.8 x 2.9cm.